This vacation is exactly what I needed after all the mad packing and moving. I’m enjoying a lot of resting and reading. Granted I still have a lot of work waiting for me when I return to the States but for now I’m thoroughly enjoying Germany. I’ve been catching up on a lot of reading and will have lots of books to tell you about. Has anyone read the Inspector Morse series by Colin Dexter? I chose Last Bus to Woodstock for the plane ride. I liked the story for the most part although I had some quibbles about some aspects of the plot but for now I’d say I’d seek out the second in the series. Anyway a full review later. I’m now very close to finishing Keeper and Kid by Edward Hardy. I found out about this book through some of you and it’s been a really fun read so far. I’m also near the end of Dead Witch Walking by Kim Harrison. While I’m enjoying it, I feel like I’ve read it before. Could that possibly be?! I don’t think so but there are some things that feel very familiar about it. Speaking of witches, we were in the lovely Harz Mountains this weekend. According to German folklore, witches meet up on the highest point of the Harz during Walpurgisnacht. You’ll see lots of “witches” – dolls/puppets on front doors, stickers on windows, etc. I love it. 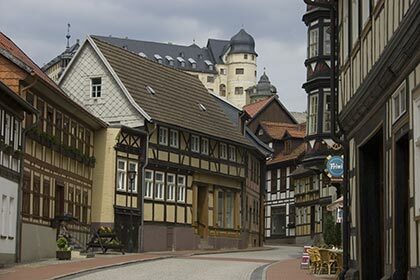 The Harz is dotted with picturesque towns, some smaller than others. Isn’t this view beautiful? I took this while walking along the trails in Lautenthal. We stayed in this charming town overnight and the next morning we set out to discover more of the Harz. We found Stolberg to be the perfect place for more picture-taking and a good place to celebrate a big birthday – I turned 40! Am I too old to be called Bookgirl? Nah. In Stolberg we had our fill of Bratwurst, ice cream and of course cake and cappuccino. We took countless pictures of the castle and oohed over all the Fachwerk buildings. I’ve been to the Harz several times and each time we discover such beautiful places. One of these days I’d love to spend a week up there taking in the natural beauty, fresh air and maybe even treating myself to some pampering at one of the many spas. I still have to tell you about the books I’ve added to my wish list after a visit to some bookstores in Hannover but I’ll save that post for another day. Oh, those pictures make me want to go to Germany right now! Have a wonderful time! It sounds like your vacation is off to a good start. I am glad you are finding time to relax, Iliana! The Harz Mountains sound enchanting! I love the photos. I would love to travel to Germany someday. Enjoy the rest of your vacation! Morse is a national institution in the UK. Even if you’ve never read him (and I have, all of them) you will know of the ITV series with John Thaw and Kevin Whately. I take it from what you say you haven’t seen those either. In which case you really should try and get hold of them. They’re British TV at its best. Happy birthday! I’m glad you got to celebrate in such a beautiful place. Can’t wait to hear about your wish list. Dorothy W. – Doesn’t Germany look dreamy? I’m very lucky I get to visit so regularly! Josette – Aw, thank you! I am having a wonderful time. 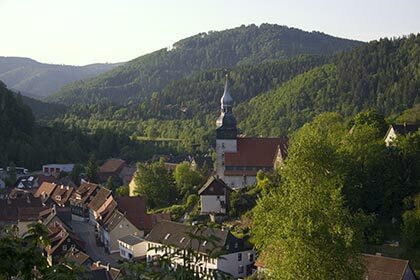 Literary Feline – The Harz are beautiful… lots of winding roads and picture postcard villages. I hope you get to visit Germany too! Ann Darnton – Nope, I haven’t seen the t.v. show and it sounds like I’m seriously missing out! Once I’m back in the States maybe I’ll go see if my library has any of the shows on DVD. That would be fun. tanabata – This is only fair as you always post beautiful pics of Japan 🙂 Thank you for the birthday wishes! Eva – It is and I’m so happy our yearly trip to Germany coincided with my birthday! Oooh, I’ve got the travel bug again. These are wonderful pictures! Happy belated birthday! What a great place to celebrate. Glad to hear you’re enjoying Keeper and Kid. Looking forward to your review. Alles Gute zum Geburtstag! Beautiful photos! What a great place to celebrate. Love your photos–they’re making me long for some travel! I hope you’re having a fabulous trip! Iliana, I wish I could go on a vacation after reading your post! The pics are beautiful, and I just love the architecture there. Sounds like a fun trip, I can’t wait to hear more of the places you visit! I’m so envious of your trip! Beautiful pics! Glad you’re enjoying Keeper and Kid. It’s coming up on my review pile soon. Les in NE – Isn’t traveling great? I wish I could travel more often – it’s just so much fun to see new things. I’ll keep you posted on Keeper & Kid! Andi – Keeper and Kid was really cute. I finished and will do a proper review on it soon but I wasn’t disappointed at all. Actually I know somewhere I had read that it was sort of like Nick Hornby’s “About a Boy” but I liked this book much better! Shadan – Thank you girl! I can’t wait to see you – we have a lot of catching up to do! Hope you are enjoying the weather and the walks! You can be BookGirl for as long as you want. Beautiful photos, and happy Birthday! I’m impressed you made time to blog hop while on vacation! Are you in the Bavarian part of Germany? My family is Pennsylvania Dutch, our ancestors were Lutheran German refugees way back when, I’ve always wished we could trace our family back to a specific region. I haven’t really started packing the books up yet. We have friends helping us pack on June 15, so I’m saving things like books, dishes, etc for when they are lending a hand. We’re still trying to figure out how we’re going to protect my books on the lower shelves from baby Maya, without spending a bundle on new bookshelves. She’s just learning to crawl…it’s making our packing quite an adventure! Kisane – I like the new 30s 🙂 I bet you can’t wait to visit with your sis & nephew. Keeping my fingers crossed that you get your four weeks vacation! Alisia – I don’t typically blog on vacation but what with the move and all I feel like I’ve been away from my blog for too long – I must be addicted. Ha,ha. Anyway, my husband and his family is from Niedersachsen (Lower Saxony) so when we come visit it’s always in Northern Germany. Good luck with packing – I can only imagine how much harder it must be with a little one starting to get into everything! You guys will do great and that’s wonderful that you have friends helping! Happy Belated birthday! I can’t think of a better way to spend it than looking at the views you’ve shared here!! It’s so gorgeous, I can’t even imagine being able to look at that every day! 🙂 By the way–that’s the one Colin Dexter book I’ve read as well, though I can’t remember any of the details as it was too long ago! I’m so jealous! I was in Germany once for about a week ten years ago, and I went to Munich. Seeing these pictures reminded me of it! Enjoy yourself in picturesque Germany! The pictures are wonderful, and so are your readings! Something about detective and mystery stories that make them great companion to airborne passengers. What a marvelously busy time you’ve had – moving and preparing for a big vacation – I’m tired just thinking about it 🙂 But what a lovely place to end up. Enjoy this well deserved respite, along with all the reading. I’ve watched some of the Inspector Morse tv shows, but I’ve never read the books. I like a good mystery for airplane reading. Looks and sounds as though you are having a wonderful time. What great places you are visiting and what a wonderful way to spend your 40th birthday. 40 years young, I say! I love your photos so much. So glad that you are able to relax and have a nice time after your move. And Happy Birthday! I really like the Morse tv show too. John Thaw is a amazing as Morse and all the beautiful Oxford scenery is icing on the cake. Like you, I’ve read the first one. I’ve meant to read more but it’s so hard to get around to all the great books- as we all know :-). Happy travels and keep well.